Today I’m co-hosting a lovely linkup over at All the Joys for some Blogger Love! The Rules: share at least one post by a blogger other than yourself. That’s it. One rule – easy peasy! It’s a fun and creative way to share some love and find some great posts. 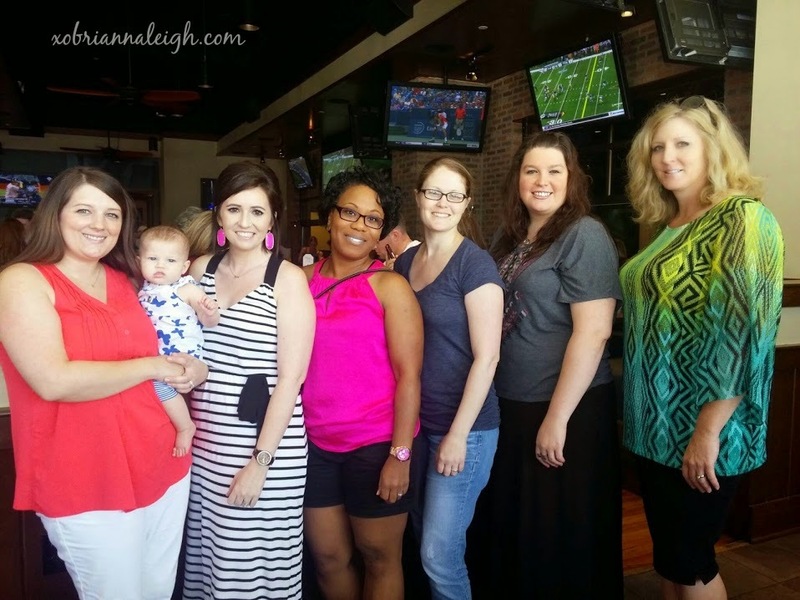 And don’t even get me started on meeting some amazing new bloggers! And, it’s easy. And nice. And, just link up because you know you want to. “Metaphorical Whiplash” by An Auspicious Adventure. Pain is hard, and in times of pain, it’s even harder to find hope and hold on to it. Casey is doing an amazing job as she deals with a suffering parent. This post is such a great reminder of where to turn in times of need, in times of hope, in times of pain. “Taylor Grace” by Anchors Aweigh. Oh, my heart. This was completely unexpected and heartbreaking news to read this week. Sweet Taylor Grace is not expected to live a very long life once she’s born, and her parents show their strength in this raw, gut-wrenching post. “We decked the halls!” by Mix and Match Family. A girl after my own heart, Shay shares her holiday decorations in her new home, including a 12-foot Christmas tree! Holy wow! The looks she captured of her sweet, sweet hubby while putting up said tree is just priceless. “Christmas Home Tour” by Living in Yellow. Another early Christmas decorator, after my own heart! It’s also this girl’s first holiday season in her new home and she was super excited to decorate. All of the little detail pictures in this post makes me just swoon for Christmas. When I first started blogging, it was for fun. It was just something for me to do in my spare time that wasn’t super expensive or time consuming (or so I thought). It was something I could play around with and just put out there for myself. No rules. No restrictions. Just me being myself for myself. Where’s the harm in that, right? And not just about the fun, weekend recaps and diy projects. I’m talking about bigger issues, like rolling with the punches, losing loved ones, how much life can change in just one year, the feeling of killing a loved one, what it’s like to go through a divorce, and loving letters to my mom and dad. I honestly never in a million years would’ve considered myself a writer. And yet, here I am. Learning and growing along the way. Oh goodness. Just looking back on some of my old posts taught me that life is fun and that I definitely make the most of it! From shmammered ladybugs, to family shenanigans, to participating in a 5k, kayaking and tub crawls, pulling off surprise parties, spending quality time with family, hiking, and cruising around the Caribbean! Documenting it just makes it that much more amazing. Reflecting on my life has taught me that it’s nothing short of amazing, full of amazing people that I call family and friends. I have nothing but abiding love for my Savior and Redeemer. Although my faith is not where I’d like for it to be, I don’t know that it ever will. I know that I will forever be pursuing my relationship with the Lord and that through it all, He is my protector. Even when I am angry and falter on my journey through this life, I lean on Him to pull me through. I am a child of God. When I throw temper tantrums because He has yet to answer my prayers or show me His will for my life, He remains steady and calm. And I am reminded time and time again that it’s all in His timing. My life is His. It’s for Him and because of Him. I have a purpose, and through blogging, I have learned that I am faithful. I love that I can share that with the world. Last, but not least, I’ve learned that I truly have a hobby. Something that I put countless time and energy into, and sometimes money. I am passionate about blogging and look forward to seeing where it takes me. One day, it just might be my job! Yes, people blog for money full time. Whoa. How crazy would that be?! But for now, I’m pretty happy and content with where this blog is. It’s my hobby, and I love it. Are you a blogger? I’d love to “meet” you! Leave your URL in the comments below so I can show you some love. Participating in #Blogtober14 with Helene in Between and The Daily Tay! Today’s prompt: 10 things you’d tell yourself when you started blogging. Seeing as I hardly remember when I actually first started blogging in life, I’m going to focus on ten things I’d tell myself when I started blogging [seriously]. As in, after that January 2013 blog post. I’m never going to get the hang of this. At first, I was obviously overwhelmed and super frustrated. I for sure thought that blogging was going to never take off for me. It’s totally taken off for me, and I’m so glad that I stuck it out! I know I’m not as ‘successful’ as other bloggers out there who only started doing this a year ago, but I’m proud of where I am and am having a blast being a blogger! And who knows where it’ll take me? I won’t be a good blogger anyway. I can’t write. I don’t have anything important to say. Who cares?! That’s a lie I told myself to not be disappointed in the beginning. I’ve learned that I can write, and I’ve been told time and time again that I should be a writer. I’m now seriously contemplating writing a book and seeing where it takes me. Isn’t this what all bloggers do? Ha! How do I gain followers? Okay, to be successful, I need followers. How? How? HOW?! I just knew that I had to have people following me and my life for me to be good at this. Little did I know that they would come! Time and effort, friends…time and effort. Eh, followers and readers don’t matter anyway. Who am I kidding? Followers and/or readers don’t matter. I’m doing this for ME! This one is true. If you start blogging for others and not for yourself then no one will want to follow you. You’ve got to stay true to yourself to be successful. Otherwise, what’s the point anyway? I am going to blog every single day! Ha! This one makes me laugh the most. Posting every day is near impossible, although some are quite successful. A few posts a week is perfection to me. I’m going to get involved in subscription boxes and linkups and giveaways like it’s nobody’s business. This is so fun! Why didn’t I know about this bloggy world before?! So much involvement, how could I not get involved? Yes, linkups and giveaways are fun and crucial part of blogging, and I’ve done my fair share. I also have a new linkup in the works, so be on the lookout for that! And subscription boxes aren’t crucial for blogging, but they sure are fun! However, this can all get overwhelming if you try to do too much too soon. It’s me and my mind and words for the world to read. Blog land is awesome and people are SO NICE! While this is true (le duh! ), there are some harsh critics out there. While I haven’t been victimized by them just yet (it’s coming, I can just feel it), I know of several other bloggy friends that have suffered. It’s like anything in life, if you’re public and putting yourself out there, heart and soul like bloggers do, you’re going to be judged. It doesn’t matter how my blog looks. It’s a way to show my personality and character! I want big, bright, and bold! Wrong, wrong, wrong! It matters how your blog looks. Mine was super chaotic and way too bright when I first posted about my frustrations last year. Thankfully, I’ve learned a lot along the way and now have a blog that’s easy on the eyes and still shows my personality. And the best part, I created it entirely by myself! Well, with the help of my techy brother and dad of course ;). I’m going to keep it fun. Motivation and inspiration is awesome, so why not share it? While motivation and inspiration is absolutely awesome and necessary, it’s not everything. I’ve learned that it’s important to talk about reality, and that includes the bad days and not so happy things. Just keep at it. Perseverance is key! As with anything, great things take time. And some failure. Yes, yes, yes! It definitely took some time to get things going and really understand all things ‘blog’, but it’s been so worth it to keep at it. So, there you have it! 10 things I used to tell myself when I first started seriously blogging. 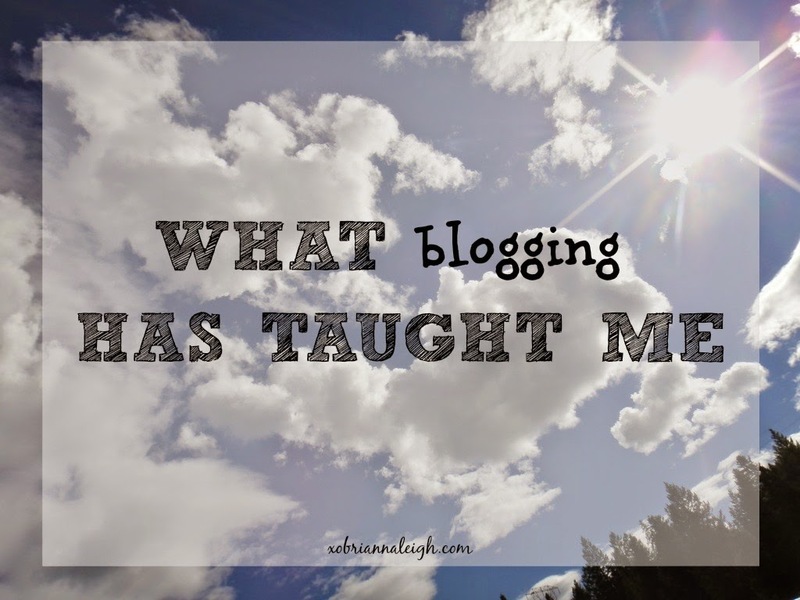 I’ve learned that I’ve learned a lot in the past year and a half as far as blogging goes! And I’m proud of where I am and praying that this blog only grows as time goes on. This past weekend was one I won’t be forgetting anytime soon, as it was our first Austin Bloggers meetup! It was also the first time I met another blogger in person (much less, FIVE!). So, Allison and Jenn coordinated a blogger meetup for us Austin bloggers this past Saturday. Umm, fun! I was completely on board and was excited for Saturday to roll around. And then it did, and…panic ensued. I only knew ONE PERSON that was committed to going (Allison), and I didn’t have her number or anything. I only had the location and time to meet up. Well, when I got there, it was a big bag of fail, to say the least. The restaurant was crowded, and I didn’t recognize Allison at all. I took to her Instagram and there was nothing. But alas, she posted that plans had changed and they were meeting a Blackfinn instead, right across the way. Okay, moving on…I walked over and again, tried to locate said group of Austin bloggers. Epic fail. Apparently there was another blogger at the hostess stand (Holly) who said we were probably looking for the same people. So, we introduced ourselves and wandered around the place trying to see someone we recognized. She didn’t know Allison, and I didn’t know Lani (her invite). We must have looked pretty lost at this point, because all of a sudden, Tisa walked up and asked if we were bloggers. Bless her heart! We were saved (ha!). We said our hello’s and were seated with our fellow bloggers. Introductions were made, laughs were shared, and stories were told. It was so much fun! It was interesting because I was the youngest one there, and the rest of them were moms and trying-to-be moms. And they were all super crafty, as in, owning cricuts and having Etsy shops crafty. Not this girl! Their stories were interesting, though, and the two babies that were there (Lani’s and Jenn’s) were absolutely adorable and pretty much stole the spotlight. They were also all happily married and talked about their amazing husbands and date nights…and I talked about my divorce and post-divorce dating life. Super. Although it was weird, they all made me feel welcome and at ease. They were super supportive and laughed along with me, which was great. And the food at this place was FABULOUS! 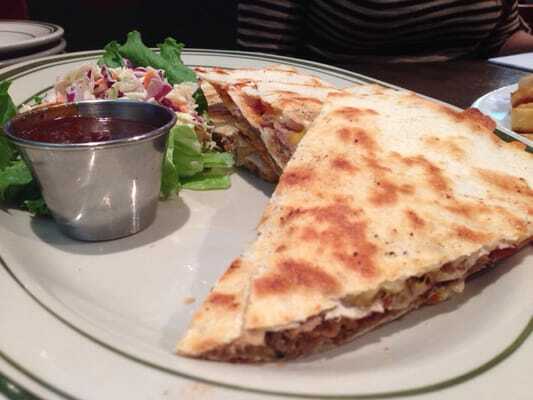 Lani and I had the BBQ pulled pork quesadillas, and they were simply amazing! Blogger fail…I didn’t get a picture. I was enjoying the company too much and was way too hungry to think about a possible picture. Oh well! But here’s a picture anyway, because they’re just that goood! I even ate the coleslaw, which I would normally NEVER touch. It was alright…for coleslaw ;). Other dishes included the spinach artichoke dip, mac & cheese with blackened chicken, and a few salads. Overall, we had a great time getting together and hanging out! We did make sure to get a picture of all of us while we were there, and being the bloggers that we are, we all noted the natural lighting in the entryway that would allow for a good picture :). #bloggerwin! I’m looking forward to our next meetup soon!